Quickly scan your product every time you run a build, and FlexNet Code Aware will automatically discover your use of open source and third-party packages, and calculate your overall operational risk. 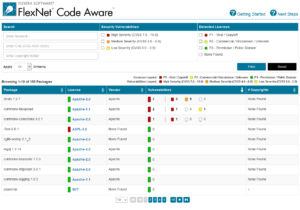 Since FlexNet Code Aware is integrated with InstallShield, InstallAnywhere or any standalone software installers, you can be aware of potential open source software security and license compliance issues before your product ships ensuring a vulnerability-free build and error-free installation. Scanning is simple. Just run a scan from your software installer project and FlexNet Code Aware will quickly identify the open source and third-party packages in your product. After you run your scan, you are quickly provided with leading operational risk indicators such as the number of open source packages identified with security vulnerabilities, intellectual property (IP) license compliance issues and copyright statements to determine your product’s level of operational risk. You will also receive guidance for remediation. The Package Inventory Report provides an analysis of your open source and third-party packages and dependencies. It organizes results by severity of security vulnerabilities as well as priority of detected licenses. The filter panel at the top of the report allows you to perform targeted queries to filter the list to packages of interest.